You might notice Macsaleapp ads on such browsers as Internet Explorer, Google Chrome, and Mozilla Firefox because the program that generates them is compatible with all the most popular browsers. As you might suspect, you will not be able to escape from commercials very easily because it is not enough to start using another browser. As the researchers of pcthreat.com have found out, commercial advertisements generated by Macsaleapp might be very intrusive and might even ruin your browsing session, which is why we recommend that you stop them from appearing as soon as possible. In order to do that, you will have to remove Macsaleapp entirely. However, it is definitely worth doing so because you will get rid of Macsaleapp ads as well. It means that you will not only be able to browse the web without any interruptions again, but also reduce the possibility to infect the system with malicious software. As you can see, it is not worth believing its promises to help you save money at online stores; therefore, we highly recommend that you do not install Macsaleapp on the system. Of course, it might enter the system without your permission as well; however, you should know that you have to eliminate it either way. If you do so, you will reduce the possibility to infect your system with malware and will be able to get rid of Macsaleapp ads. In addition, the removal of Macsaleapp is the only effective solution if you want to put an end to the collection of the data associated with your browsing habits. Continue reading the article in order to find out how to do that. It is very likely that this undesirable program will appear on MAC computers only; thus, Windows users should not encounter it and definitely not notice Macsaleapp ads on their computers. However, if you are a Windows user and still see ads on your screen, it is very likely that you have another adware on your system or cyber criminals made Macsaleapp compatible with Windows. Actually, it does not matter where you have detected it because it is still advisable to remove it from the system. It is extremely important if you want to protect your computer from serious harm. 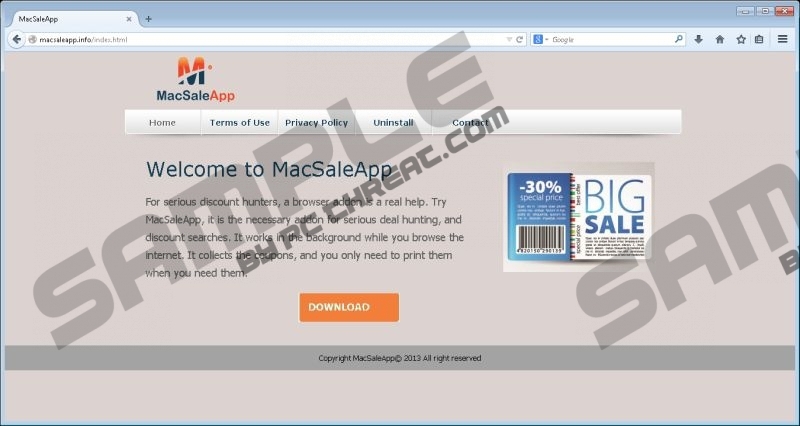 The instructions that we have placed for you below the article will help you to get rid of Macsaleapp ads. Just follow them step by step and you will erase the program responsible for commercials very quickly. Keep in mind that there might be other undesirable programs residing on your system as well; therefore, you should check the condition of your computer. Open the Extensions tab in the Safari Preferences window. Click on the extension and then select Uninstall. Open the menu and then select Add-ons. Click Extensions and then select the undesirable extension. Click Tools and then go to Extensions. Click the recycle bin button and then click Remove. Quick & tested solution for Macsaleapp ads removal.